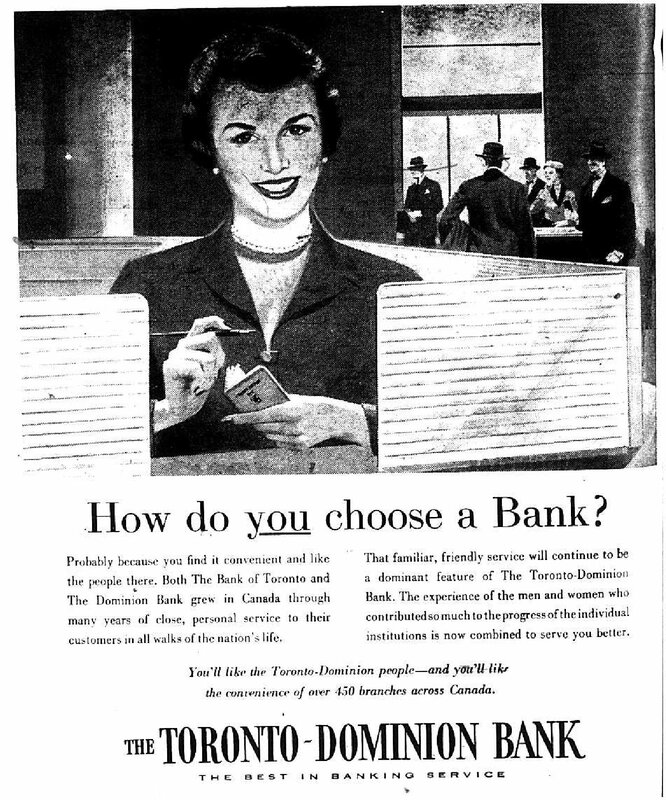 Known to most as TD Canada Trust, The Toronto-Dominion Bank is the result of the merger between the Bank of Toronto and The Dominion Bank which took place on February 1, 1955. 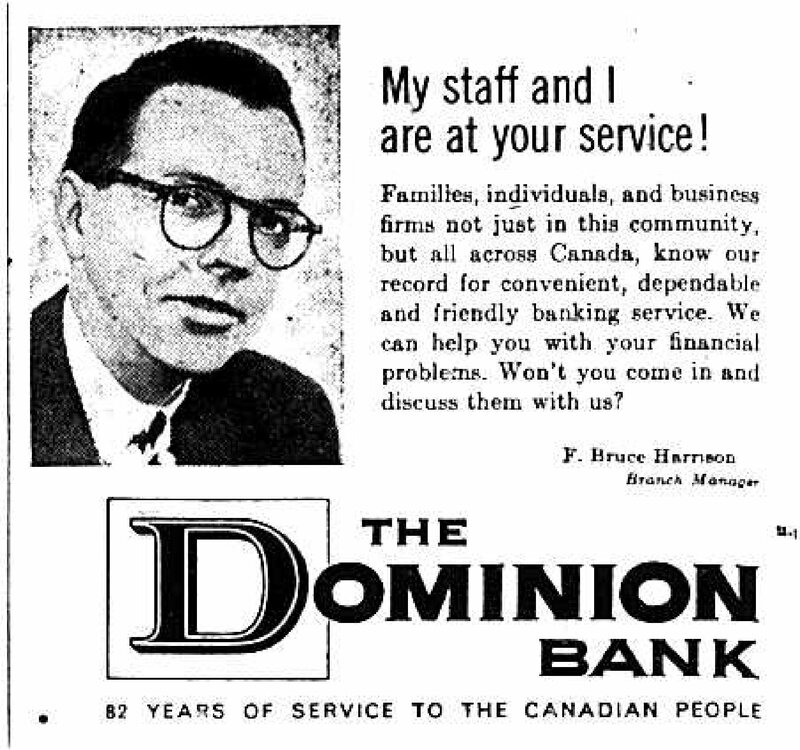 After many banks suffered significant losses during the Great Depression, and following war years, The Bank of Toronto and The Dominion Bank came to a union agreement in order to further strengthen their already large independent customer bases. This merger made The Toronto-Dominion Bank a true powerhouse in the financial industry of Canada. 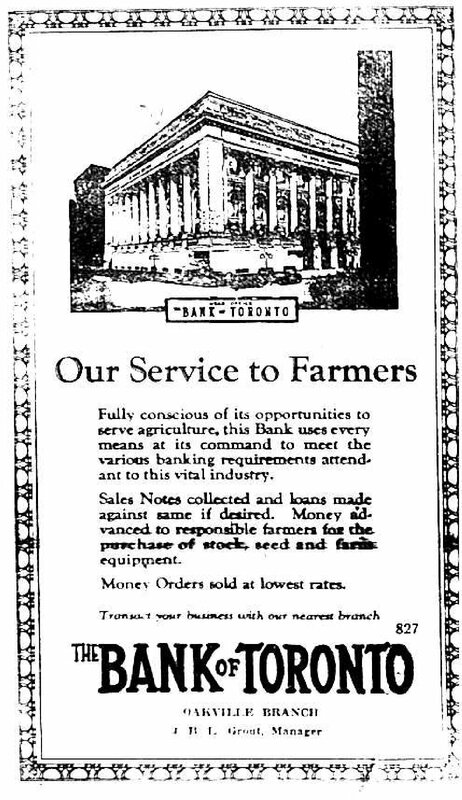 The first Bank of Toronto was opened in 1856; as the grain export trade began to flourish, this bank provided farmers with the tools they needed to expand their businesses. When the Customs House was built in Oakville to support the harbour, the bank that was located in this building was actually the first Bank of Toronto in Oakville. This branch was opened in 1857, the same year that Oakville was recognized as an official town. When the economic depression occurred in Upper Canada, this location was closed until 1902. After the robbery of Anderson’s Bank located in Downtown Oakville, the bank faced failure and bankruptcy as the business could not get back on its feet. At this opportunity, the Bank of Toronto once again opened up an Oakville branch which was very successful. By 1920, The Bank of Toronto had 161 branches located across Canada. 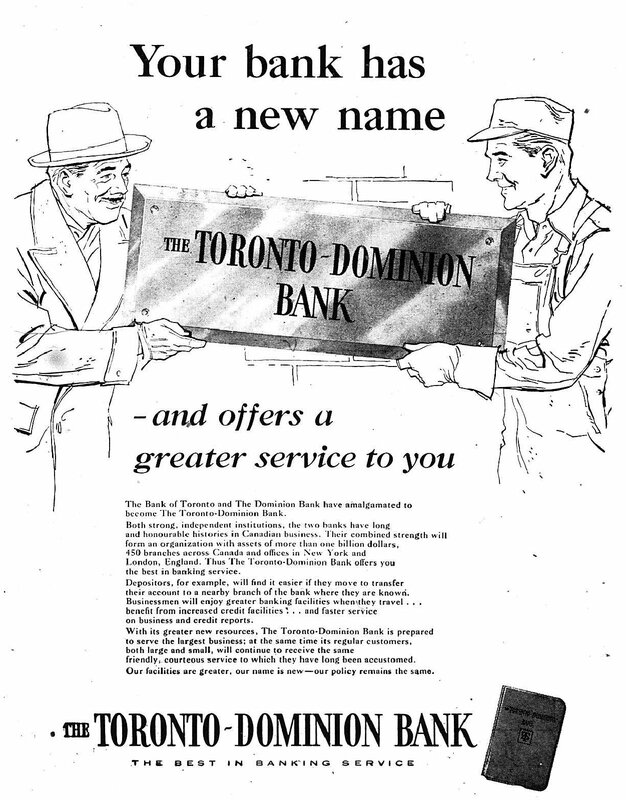 In 1871, The Dominion Bank opened its first branch in competition with The Bank of Toronto. In the 1900s, The Dominion Bank expanded overseas, opening an office in London, as well as one in New York, one of the financial capitals of the world. By 1922, The Dominion Bank could be found in every single region of Canada. This financial institution sought great expansion, and actually made history – they were the first banking company to be able to open two branch locations in the same city. The first location in Oakville was opened in 1951, proving to be strong competition for The Bank of Toronto which had strong roots in Oakville. When banking became a more competitive business in the 1950s, the idea of a union between two of the most successful banks was explored, in order to make one unstoppable financial institution. A merger was completed, resulting in the combined identity of the two banks known as The Toronto-Dominion Bank or today, TD Canada Trust. The decision to merge and create an even more successful company proved to be extremely beneficial. In 2005, TD Canada Trust celebrated its 150th anniversary. Information credited to: McKeon, Clare and Joseph P. McKeon. Oakville, A place of some importance. Burlington, Ont. : Windsor Publications, 1986. Print. and to: "TD Bank Financial Group - Corporate Information - Corporate Profile." TD Bank Group - Banking, Wealth Management & Insurance | TD Bank Group. N.p., n.d. Web. 12 June 2012. [http://www.td.com/about-tdbfg/corporate-information/tds-history/we-take-pride-in/history.jsp].